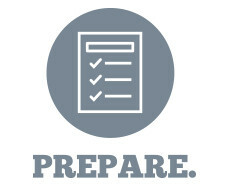 Employers typically spend 7-15 seconds pre-screening a résumé to find the right candidate. Summarize and promote your greatest qualifications and accomplishments. Reflect your most relevant personal, educational and work experiences. Review our Résumé Writing 101 presentation. Watch a great video on writing effective bullet points. Then make a résumé review appointment with our staff.. Experience comes in a variety of forms on many fronts. Use this checklist to help you recall projects or work you have done or are doing that may be appropriate for a résumé. Community involvement: Have you ever volunteered? Where? Work or job: Have you or do you have a part-time job? Where? Paid or unpaid? Extra-curricular: Have you received any honors or participated in activities such as sports, clubs or memberships? Where and what did you do? Language skills: Do you speak multiple languages? Which ones? Are you fluent? Professional memberships and leadership: Have you attended any camps or workshops? Where and what did they involve? Certification or licenses: Are you certified in areas such as First Aid, CPR, water safety, etc.? Computer or technical skills: Do you know how to use any specific software or tools such as Microsoft Word, Excel, Picasa, Adobe products, etc.? List them. Travel or study abroad: Where have you traveled or studied or served in missions? Class presentations/projects: Have you ever had a presentation or project that you completed that you are particularly proud of? Describe it. Military experience: Have you participated in the military? If so, list special training or education. The purpose of a résumé is to get interviews! A person whose qualifications closely match those sought by the employer gets the interview. Microsoft Word document (.doc). No templates. Print on high quality résumé paper. One page only, unless you have significant related experience. Second page must be at least half full. Use consistent indentation, capitalization, font style, spacing and margins. Font should be easy to read (Helvetica or Times New Roman) 10-12 point font size. No personal pronouns (I, me, you, etc.). Gather your selling points and prioritize. What key qualifications do you need to highlight? Look for key skills on job descriptions that employers are looking for. Make the key items stand out. Prepare, review & revise your drafts. Don’t make it too long. Employers generally spend no more than 7-15 seconds pre-scanning résumés. Don’t list vague information. Tell something about your experiences. Don’t be negative. List the positive skills you learned. Don't include religion, political party or national origin. Do not include salary information. If requested, provide it in the cover letter. Don’t use a photo. It may give the wrong impression. Don’t list your references. If needed, an employer will request them. Don’t tag your résumé with an incorrect title. Be sure to change the objective each time you submit. Don’t ruin your résumé with a poor format. Be as neat and use high quality printing paper. Don't send a résumé without a cover letter. Avoid these eight subtle mistakes. Contact information should be at the top of your résumé. Name is bolded and between 14-20 point font. Address information is the same font size as the main body text (11pt). Email should be professional and one you check frequently (ex: NOT huskyhotpants@gmail.com). An objective states what you are looking to accomplish through your career search. When writing an objective, specifically target the position you wish to attain. Include degree, current or intended major, university name with city and state, and expected graduation date. Include GPA or major GPA (compute your GPA) if above a 3.0, deans list, study abroad experience, related coursework, previous colleges, working 20 or more hours while in school full time, and national accreditations. Omit high school information unless something exceptional or first-year student. Use “Experience” if you include unpaid position(s). Employers want a reverse chronological list of jobs with dates of employment. List the position title, followed by the name of the employer/organization, and location (city and state). Use bullets to list key skills, responsibilities and results. Give details. Employers want to know exactly what you did and the skills you gained. Check to make sure statements are in correct tense. College degrees, honors, relevant experience, promotions, outstanding recommendations, leadership, community involvement, creativity, etc. This section allows you to include other relevant skills sought by employers that wouldn’t fit in other sections. For example, computer languages, job specific certifications, foreign languages, etc. It's important to match your skills to the ones employers look for when hiring. Have people assured you that your international experience “looks great on a résumé”? They're right! But, it’s up to you to effectively communicate how your experience has value and will benefit a potential employer's organization. Developed awareness of global economic and political issues and realities. Increased awareness of cultural differences. Enhanced cultural awareness and understanding of customs. Intensified understanding of others’ cultural views of the United States. Increased confidence in working with individuals and groups from other cultures. Gained independence in taking risks and dealing with unfamiliar situations. Demonstrated ability to problem-solve and handle difficult situations. Deepened understanding of lack of resources available in other countries. Improved personal skills in organizational management, handling budget, patience, adaptability, flexibility. Improved communication skills including listening and observation. Increased ability to maintain an open mind and be understanding of others. Expanded ability and willingness to travel. Improved skills and knowledge in my discipline such as ... . Always include international experience on the résumé, even if you do not think it relates to your objective. It almost always does. Assisted with creating strategies for marketing agricultural products. Increased awareness of global economic and business practice. Adapted easily to changing circumstances. Organized, implemented and supervised structured recreational activities for children. Worked and communicated in German with supervisors and co-workers. Travel throughout Germany and visited historical sites. Traveled through seven countries in Europe during summer of 20xx. Used speaking skills of three languages -- French, German, Italian. Read, write and speak Japanese proficiently. Studied abroad in Japan and increased ability to be open-minded and understanding of others. Gained an appreciation for diversity while living with a Japanese family. How does your international experience relate to your field? Know your objective and the career field in which you intend to work. "My studies in Japan provided me with a great insight into the cultural differences that influence consumers in different countries and will improve my ability to contribute to international marketing initiatives." If your career goals do not include a specific international dimension, you can promote the general transferable skills that apply to most career fields such as diversity awareness and flexibility. Plan how and where you will refer to your experience abroad. While it is important, it is only a small piece of your qualifications. Complete a specific project, research, or case study related to your field? Learn to work with a more diverse group of people, or work with a specific culture related to a particular company that has connections in that country? Learn new activities, languages or skills? Develop skills through experiences or independent travel? The first “look” at your résumé may not be with human eyes. An employer may use technology such as a search engine to screen applicants. The scan searches for skills, qualities, or minimum qualifications that fit the position requirements. Then, a human resources professional reviews the applications that fit the best and decides who to interview. Realize that the job and internship search process is an active process. If your only strategy is submitting résumés to job boards and waiting for a response, you will limit your chances at an interview. Attend a career fair, professional conference, or network with industry professionals in addition to your online application. Make sure your résumé addresses specific skills the employer is seeking. Use key words described in the job posting. This will improve the chances the search engine will return your résumé as a match. Submit your résumé in a format that employers can read online. Follow the instructions on how to submit your résumé. Make sure to attach your documents in the format they request (.PDF, .doc, ASCII file, etc.). Follow directions. Enter the correct data in the correct field and complete all fields, even those that aren’t required. Tailor your information to the position. Don’t copy and paste text from your generic résumé. Use key words and industry verbiage. Select key vocabulary from a company's brochure, website, advertising, etc. Do your research. If the company offers an optional assessment test online, take it. Include a strong objective. Match this to the specific position(s) available at this organization. Complete the application in one sitting. Some sites will not allow you to re-enter or change your application. Make careful note of any user names, passwords or PIN numbers if you have to register on sites. Be professional. Electronically submitted information is governed by the same laws of copyright, defamation, discrimination, etc. as other forms of written communication. Keep a saved record of each document submitted in an application. Before submitting, print off the completed application and proofread (spell check and grammar check). Make any changes and save or print off a final copy as a reference and as proof of application. Make sure your résumé can hold its own in a very simple format. The best way is to save it as a PDF because it cannot be edited by accident. Limit attachments to only what the recruiter has requested. Request a receipt of application acknowledgement either in your cover letter, or by setting up an automatic recipient received message through your email. Select a title for each attachment such as Résumé for J Smith, Cover Letter for J Smith, References for J Smith. What if an online application requires you to cut and paste your resume to a text box? Cutting and pasting a Microsoft Word document to a text box does not produce a well formatted resume. You need to use a Plain Text document using the Windows Notepad program. Since Notepad does not use tab stops, all information on the resume is formatted off of the left margin. Use spacing to separate key sections of the resume. Use them for your résumé, LinkedIn profile, or other professional platforms. Summary- a few short, well worded, well targeted sentences that summarize your skills, competencies, and experiences. Example- Engineering Graduate with leadership training and experience with academic training at St. Cloud State University. Proven skills in project management, organization and research. Able to provide employers with administrative support and professional communication skills. Objective- a short, targeted statement that clearly outlines your career direction while positioning you as someone who fits what the employer is exactly looking for. Example- Dedicated and motivated engineering graduate seeking entry level assistant quality control manager position. Objectives may still be effectively used in résumés, but in today’s job hunting world it would prove more useful to utilize a summary. Summaries give a more detailed insight, “snapshot” per say, to readers about whom they are reading about, compared to the one sentence an objective provides. Once you know what you want to do, your next step is identifying where you want to be—think industry, city, and companies. Then, research your industry and key trends affecting it now. Read relevant industry news articles, research companies, and analyze job descriptions you’re interested in. With your knowledge of your target industry, it’s time to figure out how you fit in (or want to). Identify, describe, and refine your key selling points with your end goal in mind. Then, craft them into three to five sentences, shooting for statements that are vivid and that clearly illustrate what you bring to the table over anyone else. Registered nurse with experience in providing compassionate care to multicultural populations and competent in observing patients for condition changes. Knowledge of developing, altering and implementing care plans in accordance to patients’ healthcare needs. Special interest in pediatric care. An ambitious criminal justice graduate, driven to serve others. Seeking work in capacity of a correctional officer. Experienced in communicating with inmates and explaining release conditions effectively. Expertise include emergency situations management, activity supervision, and record keeping. Dedicated and student-focused elementary education professional who is committed to providing holistic, supportive, and engaging environment for all learners. Committed to grow and learn professionally, while ensuring every child’s learning styles and abilities are addressed. Honors graduate of St. Cloud State University Communications Studies program seeking a position in training and development. Offering hands-on experience from classroom experiences, corporate training, and communication research. Specializes in conflict resolution in the workplace. Accomplished sales and marketing management graduate from St. Cloud State University who excels in strategic planning, marketing, sales, and support of advanced technology solutions. Keen on presentation, contract negotiation, and communication skills and abilities. Dedicated mechanical engineer with field experience and technical expertise to provide high quality mechanical component and system support. Skilled at formulating and implementing equipment designs, testing and producing specifications, and researching product applications. Specializes in testing and diagnosing electromechanical system functions. D’Elia, R. & Skillings P. (2017). The new grads map to résumé writing. Biginterview. N.A. (2016). Résumé Profile Statements for Teachers. Cover Letters and Résumé. N.A. (2017). Engineering résumé samples. Career Live. Simpson, M. (2015). How to write a killer résumé objective. The Interview Guys. Simpson, M. (2015). How to write an amazing objective statement. The Interview Guys. Zhang, L. (2014, August 28th). The Résumé Summary Statement: When You Need One and How To Do It. The Muse. Cover letters connect your experiences on your résumé to potential future positions. They highlight your strengths, accomplishments and can be tailored to the needs of the potential employer. Once your letter is ready, schedule a cover letter review appointment. Cover letters are the key to making a great first impression. It is your opportunity to personalize your résumé and target your skills to that specific employer. It connects the past experiences listed on your résumé to your potential future position. They allow you to go in-depth about important experiences. They also highlight your strengths, accomplishments and personality. Employer invited: An employer has asked for your résumé. Uninvited or cold contact: Match your qualifications to the perceived needs of the employer. This strategy requires that a phone or personal contact with the employer either precede or follow the sending of the résumé and cover letter. Referral: Use the referral letter to contact employers to whom you have been referred. E-note: Use as a shorter version of your cover letter; either in the body of an email or uploaded onto job boards. A cover letter needs to be concise and well formatted to be effective. It should use action words and descriptive statements to convey qualifications and career objectives. It should identify why you should be called in for an interview. It should use words from the job ad or description. It can explain any problems or questions such as gaps in employment or anything that may not be clear in your resume. Do I have to write/send a cover letter with my résumé? Yes! Anytime you send or submit a résumé it should be accompanied by a cover letter. When possible address the cover letter to a specific person by name and title. Customizing the cover letter for a particular company can also get your résumé past the first barrier. The same cover letter cannot be used in every situation. Keep it short and sweet! Three to five paragraphs and no more than one page. Use the same paper stock you used for your résumé. Sign in blue ink. It implies the letter is original and personalized. The only alternative color is black. Write "Enclosure" at the bottom. This indicates other documents accompany your cover letter. A curriculum vitae, meaning "course of one's life," gives much more detail than a résumé about academic and professional accomplishments. Curriculum vitae are most often used for academic or research positions, whereas résumés are the preferred documents in business and industry. A CV focuses more on responsibilities such as writing, researching, and teaching, than administrative duties and skills. It should present your competencies and experiences related to the needs defined by the prospective employing organization. Course highlights or areas of concentration in graduate study. Professional association and committee leadership positions and activities. Academic awards, scholarships, and fellowships. Foreign education and travel abroad. Despite the length, it's important to write concisely and present it in a clean, easy-to-read layout. Asking faculty members in your department. Consulting professional associations for additional guidelines and examples. One to three pages for bachelor's and master's degree candidates. Two to five pages for doctoral candidates. Five or more pages for an experienced academician or researcher. "Curricula vitae" (vee-tie) is the plural form; "curriculum vitae" is singular. The informal shortened form, "vita" standing alone, meaning a brief autobiographical sketch (Webster's), is singular, while "vitae," is plural. The abbreviations CV or CVs are often used. Make an appointment to review your CV with the Write Place and use your faculty advisor as a resource. Sending a thank you letter leaves a positive impression and can sometimes be the deciding factor as to who gets offered the position. It is important to send a thank you to each of the individuals you interviewed with within 24 hours after the interview. If you decide you are no longer interested in the position, it is still common courtesy to send a thank you note as it reflects your professionalism. It also keeps the door open if you should become interested in the organization sometime in the future or if the person you met with knows of another opportunity that might interest you. Use a card and hand write your message. Use the same paper that your résumé was printed on and type it. The letter should be concise and in a business format. Show genuineness and professionalism in your message. Try to personalize your letter while maintaining professionalism. Show your appreciation for the opportunity to interview. Make a specific reference to the position. Reiterate your interest in the job or internship and remind the interviewer of your key competencies that match the position. A portfolio that reflects your major work and accomplishments is excellent preparation for supporting your answers to employer's questions. Creating it forces you to think about which accomplishments will be important to the interviewer. Simply preparing a portfolio gives you a better idea of how well you qualify for the position. Communicates a high level of preparation and strong interest in the position and organization. Demonstrates experience in critical knowledge areas, as well as enthusiasm, creativity, confidence, personality and work ethic. Allows you some control in the interview, which is especially desirable if you know that the employer is looking for candidates with a higher level of “take charge” ability. Adds a critical dimension to your résumé and interview process, making it easier for the interviewer to remember you from a large pool of candidates. Decide on the format (physical or electronic). Depending on your career or job outlook, your career portfolio will take on different looks. How will you use this portfolio? Will you take it with you to show in an interview? Will you send it with your résumé or job application? Choosing a presentation binder is an important step because, if you don't already know it, presentation is everything. Look at your skills. What have you done? Can you get screen shots of it? Print items, preferably in color, to put in your portfolio. Look at yourself the way prospective employers would. The meticulous attention to detail that it takes to create a good portfolio shows them initiative. Choose showcase items that are the very best examples of your skills and work. Customize your portfolio. Select work samples based on the job description. If you are looking in multiple fields, have multiple portfolios. Certificates of honors or awards. News articles about volunteer work, project organization, community involvement, athletics. Writing examples including papers, articles, stories, poetry or music. Teaching or coaching experience, lessons or work-out plans, tutoring plans. Brochures or public relations items. Pictures of bulletin boards, artwork, volunteer work or activities. Audio or video tape of performances. Computing skills. Include programs, websites, etc. Research skills. Include a description of research project, research papers (copy), lab reports, etc. Licenses or certificates such as lifeguard, CPR, teaching, insurance, real estate, CPA, etc. Copy of degree, diploma, academic record, transcript, etc. Publications that include stories, poetry or research. Consider how much time is likely to be spent on a particular item. Do not expect a prospective employer to sit and read a 14-page report, even if you did a great job. Prefer visual examples of your work. Drawings, photos, diagrams, etc. won't compete for attention with you. Consider making screencasts. Use smaller samples of larger works. If someone is really interested in knowing more, you can send more later. A smaller piece can still be a great talking point. If a written work is the best way to showcase your skills, you can send it, or a portion of it, electronically for your interviewer to access in advance. Also have it with you and describe and summarize it and its importance. Backup a digital copy of your work portfolio to keep it updated. Espresso Work, for example, allows you to remain prepared for urgent interviews and to update your portfolio quickly. In addition to a traditional portfolio, you may want to create an electronic portfolio to supplement your résumé. You can include a "mailto" link that will let employers contact you with a simple click. Shows employers that you are familiar with various types of computer technology and programs. Word processing files for your writing samples and your résumé. Scans of appropriate photos and certificates. Adobe Acrobat (pdf) files of graphics or brochures that you have designed. A link to your major department's pages. A link to the curriculum for your major, and other appropriate links. Avoid personal information and inappropriate links anywhere on your web site. Put your online portfolio on a different server than your personal web connections. Anyone with enough web experience, including potential employers, can easily explore more of your web pages beyond your portfolio. Photographs of community service projects or overseas project partners. Voice recording of reading or singing material. Scanned images of artwork, or solutions to math problems. QuickTime VR movies of sculptures, objects or locations that show who you are and how you work. Audio or video recordings of professional work and skills. Multimedia projects or web pages exploring curriculum topics, current events or social questions. A reference letter is provided for an employee by people who are familiar with their work or character and who have positive remarks to make. Depending on the employees' request, the letter can be employment-related, personal, or it can demonstrate the character of the individual. We suggest individuals who know about you and can discuss your work-related qualities. Past and present employers usually know valuable information about your reliability, initiative, quickness to learn and take on responsibility, and your ability to work with others. Faculty members may know about your academic ability, productivity, and timeliness, and perhaps have observed how you work with others. Advisors and coaches may have relevant information about maturity, initiative, interpersonal skills or leadership qualities. Don't list references who only know you in a social capacity. Employers don't place value on family and friend references. Obviously you do not want to offer as a reference someone who would not speak about you in positive terms or who doesn't know you well enough to give a strong reference. Contact each person you are asking to serve as your reference. Don't assume. Secure the person's permission in advance. It will not enhance your image if a prospective employer calls a reference you listed and finds the reference is surprised to be called. Once you have permission, verify all details of your references' contact information, including spelling of names, titles, addresses, phone numbers and email addresses. Give each person a copy of your résumé (or vita). You may also want to complete and provide the Candidate Information Worksheet to let your references know about your interests, abilities and experiences. A faculty member may know your academic skills and an employer may know your on-the-job characteristics, but each may not be aware of the other facets of your background. Well-informed references will provide a more better reference to employers. Keep your references posted on your activities and progress. Prepare your references by telling them the names of people and organizations to whom you have given their names. When possible, give them a copy of the job description for the position for which you are applying. Thank each reference in writing for their assistance. Communicating with your references is not bothering them. Brief, cordial e-mail or phone messages show you are businesslike about your job search, and that you appreciate your references. Do not include "References available upon request" on a résumé. Most employers assume you can supply references. Do not include references on your résumé. Create a separate reference page. However, on a curriculum vitae it is customary practice to include references. Your name and contact information should be the heading on the page just as it appears on your résumé. Format the sheet like your résumé. It provides continuity and looks professional. List your references in order so your best references are first. You want a company to call your strongest reference first. Make absolutely sure you have spelled your references' names correctly. Our Suggested Guidelines can help reference writers and candidates seeking reference letters. It includes a form that we suggest those seeking a reference complete to help those providing the reference. If you feel you can't write positively on behalf of the candidate, please discuss your thoughts with the candidate and feel free to deny the request for a reference. The capacity in which they know you (i.e., you were a summer intern and they were your supervisor). Time frame of the relationship (i.e., summer of 20xx or has known the candidate for four years). Positive qualities demonstrated in the capacity in which they knew you (i.e., trained other employees, designed posters, and presented proposals to clients). Factual information on performance supportable by documents. Some employers have a policy of not giving references. They may confirm dates of employment, but otherwise be unwilling to comment about a former (or current) employee for legal reasons. This is due to concerns about litigation if there are any negative consequences arising from a reference statement. Ask before you assume that a former (or current) employer will serve as a reference for you. If company policy prohibits a formal reference, consider if you had a supervisor or coworker with higher rank who clearly valued your contributions and work ethic. Perhaps the person would serve as an informal reference or speak off-the-record on your behalf.